Hammersmith Review From ‘This Is London’! – Paul Weller News! Hammersmith Review From ‘This Is London’! 1 Comment on Hammersmith Review From ‘This Is London’! A week shy of his 50th birthday, Paul Weller represents the rarest of musical commodities: a rockstar who is growing old gracefully. He may have kept the iconic haircut — growing old being one thing, sacrilege being quite another — but the Modfather has never stood still. Indeed, his latest album, 22 Dreams, his ninth to date, is also one of his most ambitious, seeing him take on everything from Krautrock to the spoken word. Last night Weller’s UK tour took him to the Hammersmith Apollo, where he played a generous two-hour set in front of an adoring crowd. The spiky menace of From The Floorboards Up nodded at Weller’s punky past as frontman in The Jam, while new songs like the piano-led Empty Ring suggested a more melodic future. Out Of The Sinking, a favourite from Weller’s seminal 1995 album Stanley Road, was augmented by his tasteful bluesy guitar licks, although he’s not quite the guitar hero you feel he’d like to be. All gyrating hips and flailing arms, the Modfather sent his mic stand crashing to the floor early on. Later, he would inadvertently send an expensive-looking guitar toppling to the same fate. 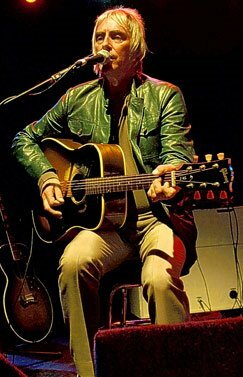 An acoustic interlude gave Weller a chance to steady himself. Seated on a stool, an inspired reworking of The Jam’s The Butterfly Collector brought the crowd to their feet, where they stayed and sang for the haunting Wildwood. Better still was a ferocious version of Eton Rifles — a song that David Cameron recently professed to enjoying, much to the distaste of the Left-wing Weller — which suggested that rock’s elder statesmen could still teach the young guns a thing or two about protest pop. More than a rare commodity, Weller is a national treasure. i thought it was a very poor performance,didn’t stay till the end.after an hour i shouted”can you play something good now please .poor old paul should retire and leave us with good memories instead of carrying on with this drivel..